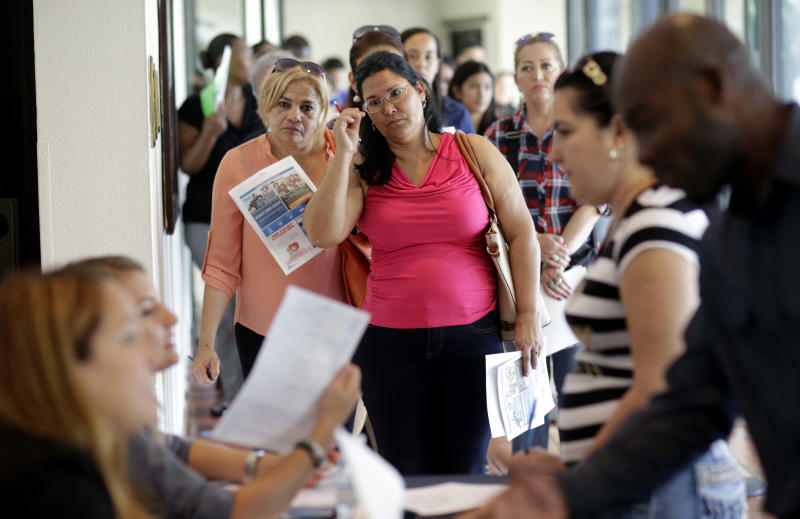 Florida job fair (January 2016). The bad is that too many of the new jobs continue to be created in low-paying sectors that often rely on part-time workers who don’t get benefits. Retail added 46,000 jobs, the leisure and hospitality industry created 34,000, while manufacturing and construction employment combined bumped up 41,000. Finally, comes the ugly. Average hourly earnings increased a pathetic 0.1 percent, well below the modest 0.3 percent anticipated. The disappointing average wage increases shocked analysts because in 20 states and the District of Columbia minimum wage increases took effect in January. For the sake of completeness, I note that the meaningless unemployment rate ticked up from 4.7 percent to 4.8 percent. Although not included in mainstream January jobs reporting, the most disappointing news to Trump supporters is his delay in ending the deferred action to childhood arrivals (DACA) program. On the campaign trail, Trump repeatedly promised that he would revoke former President Obama’s unconstitutional DACA executive order that gave employment authorization to about 750,000 illegal immigrants. Based on the unwillingness of administration representatives to talk about Trump’s apparent reneging on DACA, his supporters have reluctantly concluded that it will remain in effect for the indefinite future. Whether an illegal alien or a U.S. citizen becomes employed, it all counts the same to the BLS. But Trump supporters view those 750,000 employed DACAs as displacing American workers. Worse, as long as Trump refuses to keep his promise to cancel DACA, the list of recipients grows larger and American worker displacement deepens. On average, U.S. Citizenship and Immigration Services processes several hundred new applications and renewals daily. Trump voters feel hoodwinked because the President could end DACA by sending USCIS a memo ordering its immediate suspension. Trump’s DACA waffling has been overshadowed by his executive orders on the border wall, and on refugee resettlement. But Trump should understand that, once spurned, immigration enforcement advocates have long – very long – memories. Time is short for Trump to make good on his pledge to halt DACA.